[Updated] Emergency services have responded to a collision tonight [Jan 16] located on Harbour Road in Paget, which appeared to involve a motorcycle. 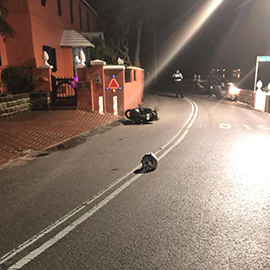 Bermuda Fire and Rescue Service personnel, police and an ambulance attended the scene and the motorcyclist was transported to King Edward Memorial Hospital for treatment. Further details are limited at this time, however we will update as able. Update 11.59pm: A police spokesperson said, “First responders attended a report of a road traffic collision that took place on Harbour Road in Paget in the area of Highwood Lane at 11:21pm. “Details are still emerging but it appears that a male on a motorcycle was traveling on Harbour Road when he lost control of his cycle and collided with a wall. Update 11.52am: The police have now confirmed the death of 40-year-old Richardo Gibbs Hill.